Samaritan publishes medications/drugs which are part of a hospital treatment (as well as any meds related to a qualifying medical condition prescribed by your doctor), and 4 months (120 calendar days) worth of maintenance drugs related to that same need (cancer treatment drugs and antirejection medication do not have this limit). Long term medications are not publishable. This means we need to find ways to save money on prescription medications. I researched a few of the drug discount cards, but far and away, there was one that saved us the most money when I looked up the meds we had needed in the past three years. This is both a website and a mobile app. They are wonderful. There’s a coupon you can print or pull up on your smartphone app and have the pharmacist run it in the same way they would run insurance codes. 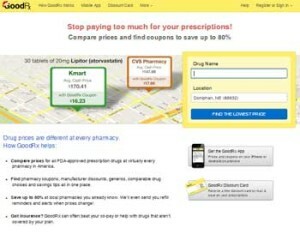 Amazingly, the costs for generic and brandname medications are sliced to pieces using this site. It’s free to use, and you can get great deals. The website offers more than just discounts, they also have tips on which pills you can cut in half (get double the dosage and cut the pill in two) in order to save money. They have a blog and facebook page which gives updates on brand name drugs which are soon going to generic (that info is also on the website specific to each drug), and they make it easy to see prices for related generics based on dosage and amounts. For instance I found that one pill I take has 6 different generic options, some of them more expensive than another. Since they’re all basically the same drug I can ask my doctor to change my script to the cheaper one and I’ve just saved money. It’s a great app to have with you at the doctor’s office. If he prescribes a medication, you can look it up right away and ask about any cheaper options. Doctors have found this to be very useful because they want to save their patients money on drug costs. If the drugs are too expensive their patients don’t take the meds, and they don’t get better as quickly. I used to think that my regular insurance was saving me a fortune on prescription drugs. Then I looked up my meds on goodrx and discovered that a couple of my meds were actually cheaper using the goodrx coupon than the copay I had through insurance! I guess insurance wasn’t doing me as many favors as I thought. And the other drugs were no more than $10/month higher than what I paid using insurance. These situations may not be true for everyone, but real people are saving real big money using goodrx and healthcare sharing ministries like Samaritan. If you create a free account with them you can track your medications and even compare your costs against your Medicare plan (if you have one), which is very helpful for anyone stuck in the medicare drug donut hole. Update: 3/17/16 — There are two other online price checking options I learned about which may even show you more than goodrx. These other two, OneRX.com and LowestMed.com both showed me pricing for my small local pharmacy which goodrx has never been able to do. And each one shows a slightly different price for the same medications and dosages, so they apparently have slightly different contract rates. Using all 3 together could get you even better prices on your medications. OneRX also shows you coupons that can be stacked with insurance in case you still have a drug insurance plan that you’re still using. Canadian pharmacies can also offer savings, and only recently got confirmation of one from another Samaritan member as being a good one. Click over to this blog post on Canadian pharmacies and hopefully the list of good online pharmacies will grow to give us even more cost saving options.